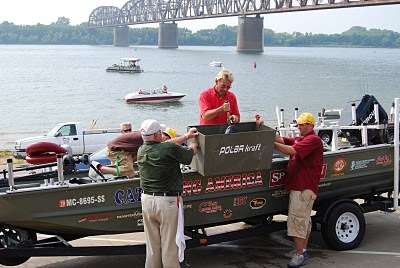 The Cabela’s King Kat tournament trail will hit the waters of the Ohio River at Henderson, Kentucky April 30, 2011. 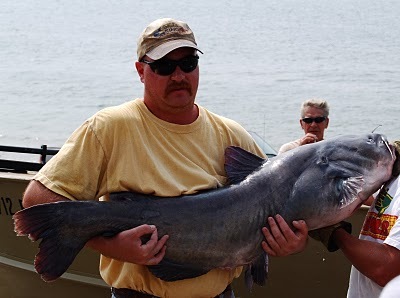 This is the opportunity for local catfish anglers to compete for cash, prizes and a chance to advance to the Cabela’s King Kat Classic to be held on the Mississippi River at Burlington, Iowa October 27-28-29, 2011. Be sure to check out our new website at: www.kingkatusa.com. It’s a new site with new and exciting information on our events along with special information for catfish anglers everywhere. The tournament weigh-in will be held at the Riverfront Park in Henderson. Tournament hours are 6:30 AM until 3:00 PM. All anglers must be in weigh-in line by 4:00 PM with a 5 fish limit per team. To help preserve the sport only live fish will be weighed in and all fish will be released after the tournament. For a complete list of rules phone or visit our website listed below. “Please note new rules on registration”. Registration for this event will be held at the Super 8, 2030 Hwy 41 North in Henderson.. To pre-register go on line to: www.kingkatusa.com or call 270-395-6774. The Henderson County Tourist Commission would like to welcome all Cabela’s King Kat anglers and their guest to the area and hope they take the opportunity to enjoy the many attractions in the area. For more information on the area call: 1-800-648-3128 or visit their website at: https://www.hendersonky.org . Host lodging for the event will be the Super 8, 2030 Hwy 41 North in Henderson. For reservations call: 270-827-5611. Call soon and be sure to mention Cabela’s King Kat Tournaments. Anglers may fish the Ohio River and its tributaries between Smithland Dam and the Cannelton Dam. • Monster Rod Holders Bonus (Qualifying Events): To be eligible for the Monster Rod Holder bonus anglers must have at least 6 Monster Rod Holders on their boat that they competed out of. Monster Rod Holders will pay $200 to the 1st place team. • Monster Rod Holders Bonuses (At the Classic Event): Monster Rod Holders will pay $1000 to the top placing team of the Classic if they have at least 6 Monster R od Holders on the boat they competed out of. Also, Monster Rod Holders will award the 3rd place points team a clothing and product package. • Rippin Lips Angler of the Year -All anglers and/or teams will be competing for points at each event for the right to be crowned “Rippin Lips Angler of the Year”. Anglers will receive points for finish at each tournament (Example -100 pts for 1st,99 pts for 2nd,98 for 3rd,etc.. We will count the top 4 finishes by each angler or team. In the case of a tie, those teams tied will have a fish off at the Classic. The winning angler or team will receive a Rippin Lips Sponsorship. They will get their boat wrapped by Rippin Lips and receive 4 paid entries in 2012 and will be required to maintain that wrap for 2 years. 2nd Place angler/team in the Angler of the Year Race will receive 3 paid entries for the following year and a clothing & product package from Tangling With Catfish. 3rd place in the points race will receive a Monster Rod Holder clothing and prize package. Catfish clubs and organizations may register with the King Kat Tournament Trail and qualify your top 2 teams from each event to fish in the Cabela’s King Kat Classic for their support in promoting the tournament trail. To register call 270-395-6774 or email at dvanvactor@kingkatusa.com. In conjunction with the tournament the Cabela’s King Kat Tournament Trail will hold the Cabela’s King Kat Kids event at the James Audubon State Park in Henderson.. The event is free of charge and open to all youth 12 and younger. Sign up is from 8:00 AM till 9:00 AM with the Kid’s event starting at 9:00 AM and ending at 11:00 AM. All children will receive a prize just for entering. Bring your favorite rod, reel and bait and show your true fishing ability. All children must be accompanied by parent or guardian. Prizes for winners will be given in two age groups, 0-7 and 8-12. The event is free to all children 12 and under with all participants eligible for a chance to win one of the six, Outdoor Promotions $2,000.00 scholarships to be awarded in October. Outdoor Promotions and our anglers have contributed nearly $302,000.00 to the “Kids” Scholarships since 1997. We are very proud to be a part of the education process for the youngsters who participate in our tournaments as adult/youth teams and those who fish in the Outdoor Promotions “Kids Fishing Rodeos”. Cabela’s The World’s Foremost Outfitter , Rebel Yell Bourbon, Evinrude Outboards, Rippin Lips, Minn Kota Trolling Motors, Mustad Hooks, Monster Rod Holders, Tanglin with Catfish, Adventure Products- EGO Nets, Vicious Fishing, Humminbird Electronics, USCA-United States Catfish Association, WFN-World Fishing Network, Renegade Tackle, Ron Gooding Insurance, JR Mad’s Famous Fish Breading, American Pro Catters and Action Outdoors Products-Catfishing Dream Team. For entry forms or information on Cabela’s King Kat Trail phone 270-395-6774, fax 270-395-4381 or visit our website at www.kingkatusa.com.